Thanks to MTV’s Real World DC, Bravo’s The Real Housewives of DC and the main man himself, President Obama, the District of Columbia has become the trendiest, hippest, place-in-transition to be. And our new $0.05 bag tax is just one more amazing new change to add to the list! We here at ECOBAGS.com are always excited to see real progress that benefits the environment so you can imagine my overwhelming joy and pride to see this huge (maybe 7′ square?!) advertisement at the Verizon Center during the Capitals hockey game last night. 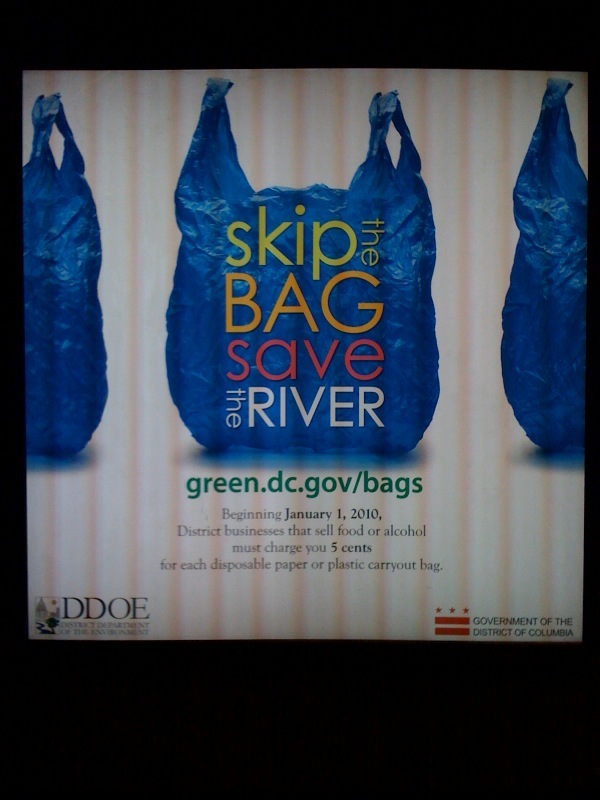 Kudos, DC and especially to the District Department of the Environment! I am the sort of hombre who passions to seek original things. Currently I am making my private photovoltaic panels. I'm making it all by myself without the help of my staff. I am using the net as the only path to acheive that. I discovered a truly amazing website which explains how to contruct photovoltaic panels and wind generators. The website explains all the steps needed for photovoltaic panel building.I am not exactly sure about how precise the info given there is. If some people over here who had experience with these things can have a look and give your feedback in the page it will be grand and I would highly value it, cause I truly love [URL=http://solar-panel-construction.com]solar panel construction[/URL].Thanks for reading this. U guys rock.